Fiendish puzzles to put your wits to the test! With this cool carry-along box of brain-ticklers, you can challenge yourself everywhere you go! 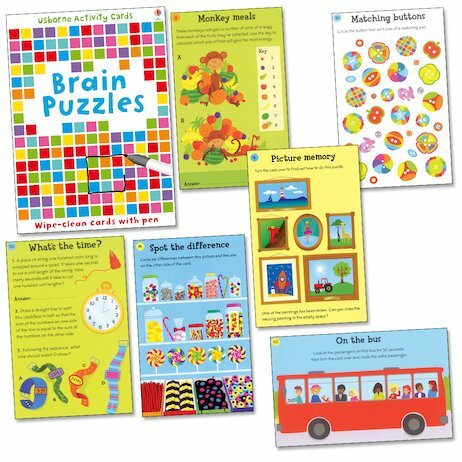 Full of brilliant puzzles that will bend the minds of kids and grown-ups alike, this colourfully illustrated pack of cards will test your memory, observation, language, arithmetic and logic skills. You can wipe them clean and use them again and again – or let your brothers and sisters have a go, to find out who’s really the smartest! Dare you take the challenge and make your smarts sweat?